I'm not really a hot drink person but something I can definitely get on board with is hot chocolate. Its my favourite thing to drink in the colder months, with a comfy blanket and a good Christmas film. You can see my top 10 Christmas films here. 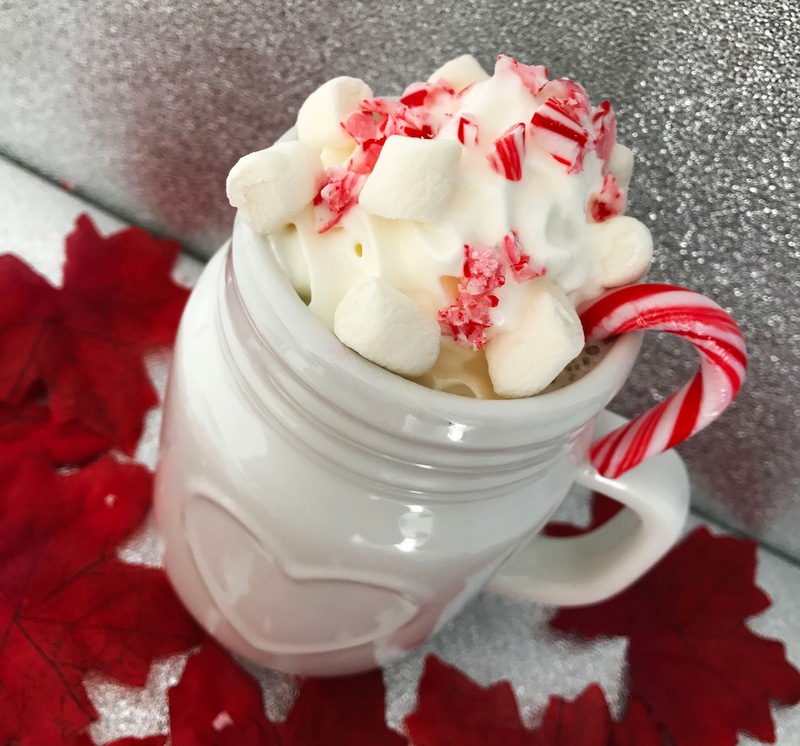 For Blogmas I thought I'd whip up something festive and a little different to the basic hot chocolate. This is a really easy peasy recipe in which you can decide the quantities and just chuck it all in! 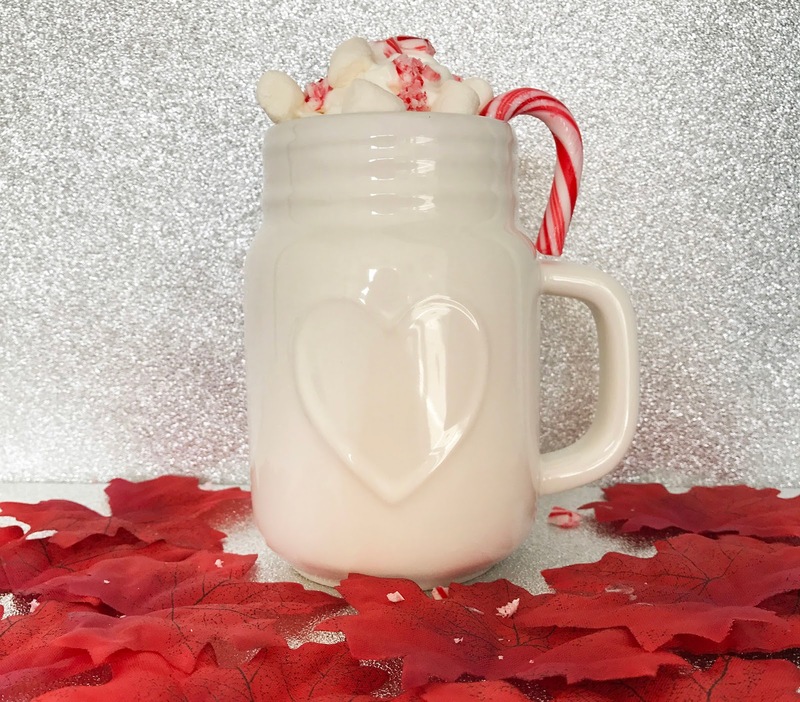 So, if you haven't guessed from the blog title I made a Peppermint White Hot Chocolate. This may sound sickly, but the balance of the sweet chocolate is cut with the after taste of the refreshing and Christmassy taste of peppermint! White chocolate - this can be in a bar, buttons or chocolate chips. Whatever you fancy! In a sauce pan pour the milk in and add in the white chocolate. For the milk it depends how many cups your wanting to make. I usually just fill the cup I'm going to use 3/4 of the way leaving plenty of room for the toppings! For the chocolate it depends on taste. I hate milk and like mine to be strong. For my own cup I added in 8 squares of chocolate. Its best to start less as you can always add more as you go - just give it a quick taste test before. Keep it on a medium heat and keep stirring to make sure the chocolate melts and the milk doesn't burn. Now to add the peppermint essence. This is optional, again it depends on how much of a fan you are. I added a cap full into mine. If you want to skip this step you can always use one of the candy canes as a stirrer to get a subtle hint of peppermint. Once you've given it a good stir and made sure the chocolate is melted and that the milk is steaming you can then remove it off the heat and pour it into your mug of choice. To cool it a bit so you don't burn your tongue, just add a splash of cream. Time for the toppings! I topped mine with squirty cream, mini marshmallows and then I added one of the candy canes in whole as a stirrer then crushed the other one in a plastic bag with a rolling pin, then sprinkled on top. Et voila! A super simple but festive drink for a cosy night in. Now I'm not meaning to blow my own trumpet but this is seriously tasty! Leave me a comment below if you re-create this recipe or share me a link to yours.